Last night I started teaching a conversation class for beginners to Spanish, which has inspired me to share a series of tips related to language learning. These tips will be geared towards students that are new to the language learning process, but could also be beneficial to the veterans. Tip #1 – Cognates are your friend! Cognates are words that are similar in 2 languages, usually because they come from the same root or language (such as Greek or Latin). One thing to be aware of is that there are false cognates (commonly referred to as “false friends”). To be embarazada does not mean to be embarrassed, it means to be pregnant! To molestar someone means to annoy them, not to molest them! A fábrica is a factory, not fabric. Recordar means to remember, not to record. To be exitado means to be sexually aroused, not excited! 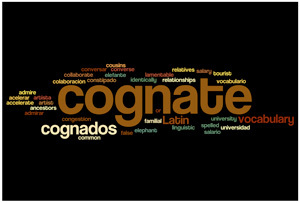 If you’re the type to study vocabulary, a list of cognates is an excellent place to start! Pura Buena OndaPura Buena Onda BlogCognates are your friend!